Many people have been pushing to get SpaceUP:UK off the ground and everyone who attends the event will of course become part of the SpaceUP:UK family. The core organising team is made up of Kate Arkless Gray, Chris Bridges and Stephanie Pau. We are working hard to bring this event to life and will need your support to make it a success. Come and say hello on Twitter or Facebook! We will be looking for volunteers to help out for the next event, so keep an eye out for us next time. Kate has mixed her science and journalism background with social media and is currently the Digital Communities Editor at the Wellcome Trust. In her spare time Kate is known as “SpaceKate” and she enjoys travel, photography and adventure. Her 10 day visit to Florida for shuttle Discovery's final launch ended up as a five month epic 'Space Nomad' adventure and a determination to get to space. 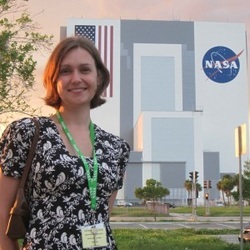 Kate completed the International Space University Space Studies Programme in 2012, won NASA’s International Space Apps Challenge in 2013 and enthuses about space to anyone who’ll listen. As well as appearances on Sky News, she reports for both Space:UK and the Space Boffins podcast, and enjoys having pen-pals in space. She quite fancies being the first woman on the Moon. Kate lives by two mottos: “Make things happen” and “Never regret, just tell good stories”. NASA administrator Charlie Bolden calls her “a true champion!” which fills her with pride. Kate believes there is a fine line between madness and genius, and enjoys walking it. 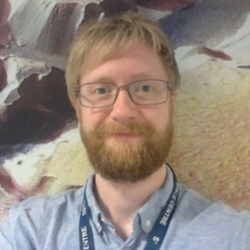 By day, Dr Chris Bridges is the On-board Data Handling Lead at Surrey Space Centre (SSC), University of Surrey. He researches and teaches computer hardware and software to accelerate reliable processing in the space radiation environment. Together with Surrey Satellite Technology Ltd., he is the SSC lead and designed, built, programmed, launched, and operated, the UK’s first CubeSat called STRaND1. The mission aimed to train new researchers and students, and fly novel payloads including a smart-phone. This led to critical acclaim from the BBC and New Scientist for creating the world’s first ‘PhoneSat’. He advises on UK and EU flight projects, including the QB50 mission, which aims to launch 50+ CubeSats into low Earth orbit (LEO) and Surrey’s own ‘solar-sail’ and ‘rendezvous-and-docking’ nanosatellites. He is jointly leading as chair the ‘UK CubeSat Network Forum’ with academia, industry, and the UK Space Agency and chairs the ‘Implementing Intelligence’ track at the world’s largest IEEE/AIAA Aerospace Conference at Big Sky, USA. By night, Chris is an amateur radio enthusiast (M6OBC) and has a passion for hacking almost any electronics for space and telling everyone, from schools to film crews, that the sky is most definitely not the limit. He secretly wishes he was Batman … or had Batman’s money anyway. Steph holds a master in electronics and electrical engineering from Imperial College, London, and besides technology she has a strong interest in art and life-long learning. She has embraced the multidisciplinary approach from the very start of her career, collaborating with a fashion PhD to create wearable electronics during her MEng. After that she started working as a software engineer across a wide range of industries, technologies and cultures, in both multinational companies and start-ups. Inspired by the possibilities that falling costs of prototyping electronics and the rise of commercial space sector, Steph has broadened her horizons further. 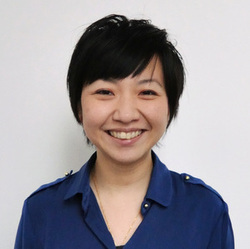 She is determined to get hands-on with space technology and exploration, and this led to her appearing on stage at TEDxEastEnd, and to a job at the Satellite Applications Catapult where she works as a Solutions Architect. Steph is also the founder of Citizen Inventor, a community/network open to all citizens who are curious about science, engineering and inventing in an open and collaborative environment. So far Citizen Inventor has focused development on - guess what - space! Steph’s quest is to let curiosity take us to places we have never imagined.